Logan County 4-H member, Lukas Aylesworth, of the Topper 4-H Club in Mount Pulaski was named the overall champion of the Illinois State Fair Master showmanship contest held on August 11th. 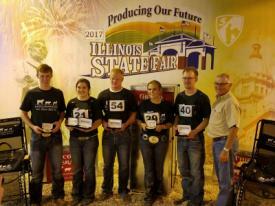 A total of 56 outstanding livestock exhibitors competed in the Illinois State Fair competition with Lukas taking the title of “2017 Overall Master Showman”. Lukas had first been selected as winner of the Logan County Master Showmanship contest to earn a place in the Illinois State Fair Master Showmanship Contest. The Master Showmanship Contest tests individual’s skills and knowledge of showing beef, swine and sheep. Contestants are judged on their visual showmanship skills and are also asked questions about each of the species. At the state contest, prizes are given to top showman of each of the three species and a master showman of all three combined is awarded the top honor. The Master Showmanship Contest is hosted by Illinois Farm Bureau and RFD Radio Network.